Picture from Wikimedia Commons. Licensed under Creative Commons. This is part one of our series called “Worth a Thousand Words,” where writers use a work of art as the muse for their story. 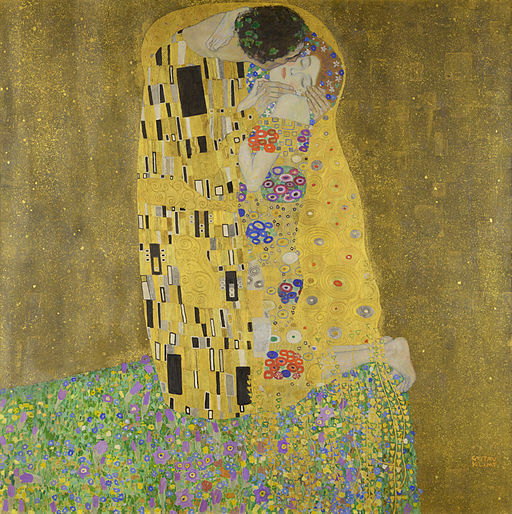 This piece by Elly Rivera takes influence from “The Kiss” by Gustav Klimt. A timid touch sends an incalculable number of signals to my heart. It swells, the same way your body feels when it’s submerged underwater. The touch encapsulates my body more than I expected. Our bodies start to mold into one another without warning. Hands that held doors open, cradled coffee mugs and wiped away tears fit perfectly behind my neck. His hands have been places I’ve never seen or traveled, but his touch stamps every early memory into my own recollection. I see him at five years old, his small hands molding a sand castle, the sand glistening like the gold hoops that adorn his mother’s ears. I hear the ocean having a nightmare; the waves making noise so loud you can hear it from behind a closed door. His hands make their way around my body, shifting from my neck to my back. He lies there as I inch my head into the crook of his neck. He can see my sister’s body enveloped in my embrace on a warm summer night, her face nestled against my chest. He hears her blossoming heart; its petals unfurling and retracting with every steady beat. He touches my hair, brushing his fingers through the copper strands. I slide my head down to meet his eyes, his emerald spheres smiling back at me. My hands, ones that wrote pages of sadness, clutched quilted pillows and tucked away photos of an old me, reach for his neck. They reach for security and comfort in the tallest of places, along with the curiosity and assurance of what there will be to hold on to. We forget our surroundings, but I imagine we’re in a field of flowers, blanketed by the gold and purple hues of spring petals. Our bodies so tightly embraced; it looks like we’re one. He smiles before kissing my cheek. The kiss sends vibrations through my body, giving my beating heart company in what was once a hollow, lonely space. Is this what love feels like? For once, my heart and mind agree. It’s the sound of two souls molding into one.